Yes it does. Sideshields are robotic arm replacements, SPEAR tip is an accessory you add over the tip of the CASKET. Works for me! If that's all, accepted! I'll get the wiki updated. Thanks, Challenger (or should I call you Method?) - not sure how that happened. Taken care of now. Then, I shall call you Method. I use Talvieno for everything, everywhere (online at least), and I actually think I might be more used to it than my given name. Aw, Bob. Barely conscious and he still wants to kill things. He's adorable. I'll do my actions tomorrow morning, btw! Wee bit delayed this time, but I'm going to get the next mission update out today if I can at all help it. I've been a bit distracted with trying to brainstorm everything that's going to happen post-mission. See, previously, with REKT: God Throws Dice, I gave you only a very tiny slice of the universe - I could pick and choose what you guys saw, which made it incredibly easy to populate the world with interesting characters, build an interesting atmosphere, make things seem at least somewhat believable, etc. However, with REKT: Beyond The Edge, you guys are going to have , essentially, free reign in a much larger play area. (Current estimate: 26 different star systems.) You are still seeing only a tiny slice of the galaxy, but rather than being able to pick and choose where you go myself, you could literally go anywhere. I mentioned previously that, to some extent, I can predict your actions. For now, this applies only in terms of things that happen on missions. This does not at all apply to an open world setting because... well, I've never given you one before! I have to be prepared for anything and everything. This necessitates a massive accumulation of lore, background, local history, details on various species, character dossiers, and the like - not because I'm trying to fully craft the galaxy, but because I'm trying to build a solid enough image of what the galaxy is and how it works in my own mind so that I can easily toss out ("procedurally generate"? sort of?) new content at the bat of an eye. I'm getting there, gradually. Bit by bit. 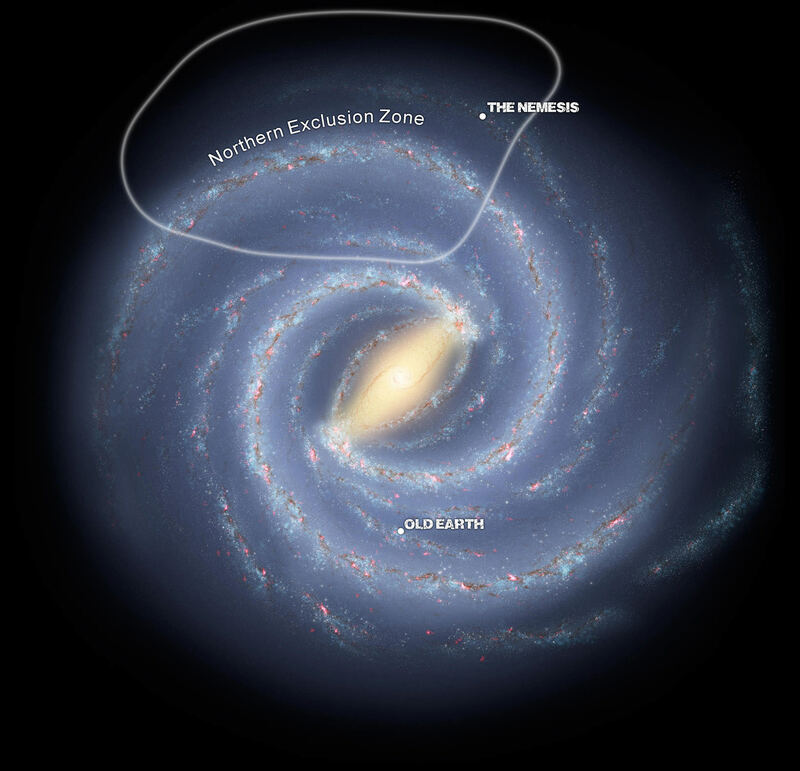 When humanity conquered/defeated the other species in the galaxy, they forced them into the galaxy's rim while humanity took over the galaxy's center, which was easier to traverse and more profitable. Some of the aliens were also forced into the area known as the Northern Exclusion Zone - named such because it was noted many millennia ago that no true sentient life existed here on its own - at least any that could build cities and advance beyond the stone age. The reason for this is, presently, unknown. The NEZ's reputation doesn't stop there - it's something of a futuristic "Bermuda Triangle", but with an actual reason. Many ships (and two entire fleets) have completely disappeared while in the zone. Anomalous materials are abundant - both in remnants of ancient Quantum technologies, and in actual mineral deposits - but strange forces are at work beyond what humanity currently understands. Venturing deeply into the NEZ is dangerous, with a high risk of not making it back alive - and a higher risk of not being able to contact the outside universe for reasons also unknown. Nevertheless, the border area where the Nemesis has found itself is somewhat less dangerous than the zone's central area. Strange things happen, and some areas are thoroughly unexplored, but overall, the risk of mysterious death is much lower. It is also part of the original territory of the Plodii, an ancient mollusc-like alien species known for both their adoration of the arts, and their mercantile skills and culture. They were one of the Big Five - a group of five proud alien races that formed the backbone of the Galactic Community (Plodus/Plodii, Bhez, Hiltorel, Gorvan, and the now-extinct Qysar (before the Qysar were replaced by the Azquad)). These races controlled all the galaxy and granted tiny bundles of systems to fledgling races at their leisure. Humanity hated them with a passion. The Plodii, whose empire had stood just over ten thousand years, are now just as crushed and broken as everybody else. And as you can imagine, they aren't happy about it. In fact, the people most likely to be friendly with you were probably the hiltorel, but you guys are screwing that up pretty nicely at the moment. There will be a reputation system - not per-person, but per-faction. Worse reputation means you need more charisma in order to "make a sale", and also makes people less likely to want to give you missions or ask you for help. Taking and accomplishing missions/quests from various persons will increase your standing with their factions - and dismissing it will decrease the standing. By the end of the campaign, you should be friends with at least a few different factions. As you can see, I'm putting quite a bit of thought into this. After your next mission, I do plan to give you guys at least partial control over where the Nemesis goes. And where will you go? Will you choose to partially repair the Nemesis's warp drives and go exploring, or go toward the next station, or complete some other mission? Or will you choose to stick around in the Nanyej system to see what other things you can accomplish? The choice will be entirely up to you - but we'll need to reach a democratic consensus (preferably at least 50% agreeing with a single option) so I look forward to heated (in character!) debates as people fight over it. Things will be fun. Regardless, though, I need to get it finished somewhat quickly. The mission on Nanyej is very near its end. So, new REKT turn coming out today, and I think the above should explain pretty well why I've been absent. Hopefully. Questions and/or comments welcome as always!